In December we highlighted an interesting pattern of eveningstar reversal formations on the S&P 500 daily chart. An eveningstar is a bearish three-day reversal formation, often seen at market tops. It consists of a large up-day, a narrow opening and closing doji-day, and is completed by a large down-day. It represents a transition from bullishness to bearishness. When we posted the December article it looked like a third eveningstar was forming on the chart. 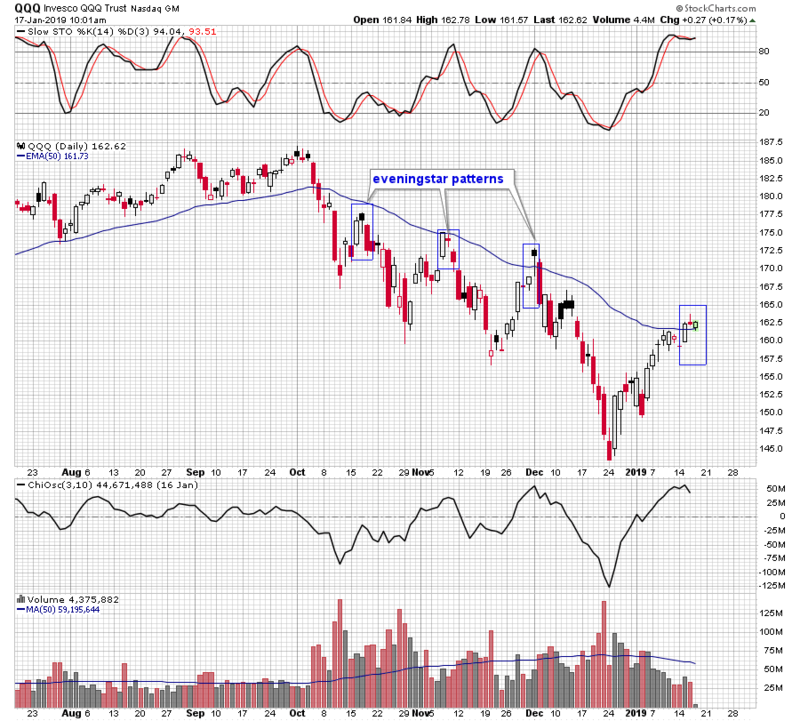 Two days later a doji candle formed and the following day a another rudimentary eveningstar was completed, right at the declining 50 day moving average. It marked the December high and was followed by the dramatic December drop. 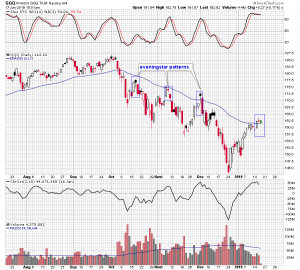 This week on Tuesday a large white up-day candle formed and it was followed on Wednesday by another doji candle. Wednesday’s doji high formed just as previous candles have at the still declining 50 day moving average. The takeaway then is to be very cautious of any real weakness in today’s session because it would be a replica of several previous patterns that marked highs in the broader market.